In the following contribution, Philip Owen of Southern African NGO GeaSphere, reports on the ecological devastation caused by the FSC certified industrial plantations in South Africa. The article illustrates the problems in one particular site, certified by the ‘Soil Association’ WoodMark, which overall has certified nearly 500,000 hectares of plantations in South Africa. Readers will not miss the irony that one of the major impacts has been on the soils of the region, and will no doubt question how such an operation could be certified by an organisation which purports to be concerned with the conservation of the world’s soil. A further 1 million hectares have been certified by the now discredited SGS-Qualifor. FSC Plantations Certification – Many Wrongs make a Right? In South Africa, more than a million hectares of high impact, industrial timber plantations have been certified by the Forest Stewardship Council (FSC) as ‘responsibly managed forests’. This despite the fact that these certified plantations consist of exotic monocultures, (primarily eucalyptus and pine) and exert un-natural pressures on the local water, soil and biodiversity resources – leading to growing water scarcity/vulnerability, soil erosion/nutrient depletion and dramatic loss of biodiversity. The FSC rewards responsible ‘forest’ management through certification – which in turn provides certified companies better access to ‘environmentally sensitive’ markets. In order to qualify for certification, plantation estates are assessed according to the FSC Principles and Criteria – which is applicable to real forests and the environmental/social services and benefits that ‘real forests’ provide. How the FSC certifying agents managed to squeeze Cinderella’s shoe onto the foot of the biggest, ugliest sister remains a puzzle. Relating to the environment, industrial high impact timber plantations are directly in breech of FSC Principles 1, 5, 6, 9 and 10. Plantation management operations destroy the grasslands multiple products and services – thereby undermining economic viability and a wide range of environmental and social benefits. Plantations management operations do not recognize maintain and, where appropriate, enhance the value of karst and grassland services and resources such as watersheds and fisheries. The rate of harvest of timber exceeds levels which can be permanently sustained. The monoculture model impoverishes the soil, leading to medium/long term deficiencies in essential elements such as nitrogen, phosphor and potassium. In addition, the loss of ground cover dramatically increases soil erosion. Plantation management negatively affects biological diversity and its associated values, water resources, soils, and unique and fragile ecosystems and landscapes, and, by so doing, destroys the ecological functions and the integrity of the natural environment. Safeguards do not exist which would protect rare, threatened and endangered species and their habitats (e.g. nesting and feeding areas). Ecological functions and values are not being maintained intact, nor enhanced, or restored. The natural grassland, which provides ecological functions have been fragmented to the extreme. Natural cycles that affect the productivity of the grassland ecosystem – such as fire – have been dramatically altered to suit the industry, not the environment. The precautionary approach is not being followed in relation to the potential threat to local karst systems. The design and layout of plantations threatens degrades and exploits the natural Karst landscape and primary grasslands. The scale and layout of plantation blocks are not consistent with the patterns of forest stands within the natural landscape – which used to consist primarily of climax grassland (a vegetation type which is the worlds ‘most threatened’ – with estimates of approx. 80% irrevocably destroyed). Diversity in the composition of plantations is not being achieved, so economic, ecological and social stability is being eroded. The grasslands which these monoculture plantations have replaced contain an estimated 4,000 plant species – none of which can survive in a exotic timber plantation compartment. The selection of species for planting was not based on their overall suitability for the site and their appropriateness to the management objectives (unless the ONLY managemet objectives is to make money). The exclusive use of fast growing high yielding exotic species has undermined the conservation of biological diversity and contributes to the degradation of local ecosystems. Soil structure, fertility and biological activity is being degraded, not improved.. The techniques and rate of harvesting, road and trail construction and maintenance, and the choice of species results in long term soil degradation and adverse impacts on water quality, quantity and substantial deviation from stream course drainage patterns. In contrast to the indigenous grassland vegetation, fast growing exotics have much more formidable and deep rooting systems, capable of fracturing rocks – accelerating the pace of natural erosion. Soil structure, fertility and biological activity is being degraded. Experience has shown that the large scale exotic pine plantations are not ecologically well-adapted to the site, that they are aggressively invasive, and do have significant negative ecological impacts on other ecosystems. Citing above mentioned ‘non conformances’, GeaSphere South Africa has recently submitted a complaint to the ‘Soil Association’ who were responsible for certifying the Sappi Sudwala plantation. 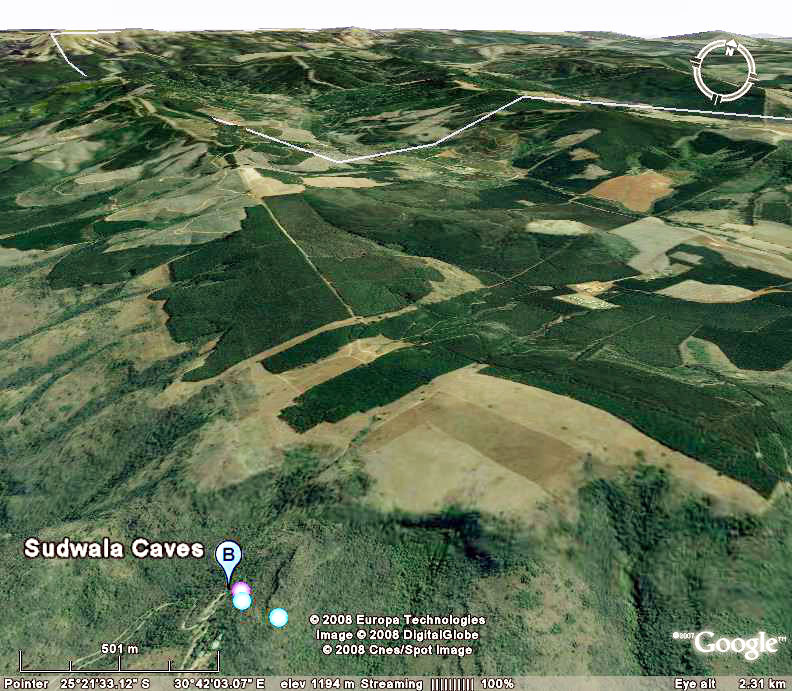 According to GeaSphere – the timber plantation compartments above and closest to the Sudwala caves in Mpumalanga, South Africa are having a negative impact on the cave by contributing to the un-natural and excessive drying out of the system. The Department of Water Affairs and Forestry has instigated a ‘ground water study’ to determine how deep rooting timber plantations affect the complex groundwater systems in order to facilitate understanding and wise management decisions. Unfortunately it will still take several years before enough research data will be available to draw conclusions. GeaSphere urges FSC, the Soil Association and Sappi to follow the precautionary approach and remove the trees as soon as possible and allow the grassland opportunity to rehabilitate. For more information about this situation please visit Geasphere. Furthermore, the South African national FSC initiative draft document does not provide any motivation for plantation companies to move towards a more sustainable form of ‘forestry’. The national initiative will continue to endorse the high impact monoculture model – to such extreme that even Genetically Engineered (GE) trees may be acceptable – excluding only the use of GE biological control agents. We accept the value of a certification system which rewards good land stewardship and management – but believe that a entirely new set of principles and criteria should be developed. The fact that exotic timber monocultures are ecologically destructive should be recognized, and incentives and methodology should be provided to restore ecological integrity to the region.